Universal Newsline - Business, Lifestyle, Entertainment : Sangeeta Babani's new series of Paintings titled "MYRIAD FEELINGS"
Sangeeta Babani's new series of Paintings titled "MYRIAD FEELINGS"
Well known Artist Sangeeta Babani is ready with her new Collection of paintings titled "MYRIAD FEELINGS". She describes Myriad Feelings in a very beautiful way through her paintings. These series depicts the nuances of the Artist's emotions and imagination. Each painting is subconsciously a motivated image provoking a beginning of a feeling, an emotion, and a thought at that time, it's spontaneous and unplanned. She is seduced by a white canvas that allows her to transform it with the Aura of Color and a variety of elements and scribbles of paint and Lines-each line made of many moments which together encompass Myriad of feelings and Emotions depicting relationships. Joy, Ecstasy, Envy, Contentment...some strong, some diluted, some welcome, others not so welcome, feelings overwhelm us daily. Sangeeta Babani Said, The series oF “The “MYRIAD FEELINGS” painting is my inner Feelings which help me to inspire and create it. Life comes out of our mind - thoughts mould the world in a direct form through actions and feelings that accumulate and combine with each other and form what surrounds us, colors and bold brush strokes help me breathe, and have become a language for me. Each painting is a result of the concentration of my soul, of myself. Each painting is evocative of my mood at that time, each a reflection of my mind. 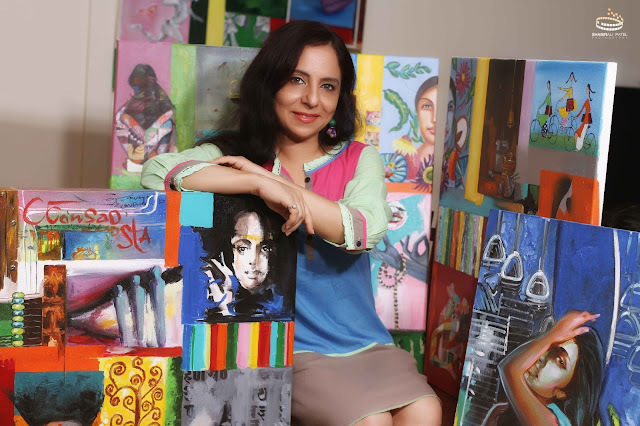 Sangeeta Babani's works involves creation of Paintings that are essentially subtle confessions. They perform the role of a conveyor of personal feelings through colors. Every piece of work is perceived as a kind of relationship between the Artist and the viewer. The show opens in Mumbai at ICasa Gallery, Raghuvanshi Mills, Lower Parel. Opening The art Show by Javed akhtar, Farooque Shaikh , Shekhar Suman on 13th June - 7pm, The exhibition scheduled till 23rd June.